On this warm Bank Holiday weekend, what better than a few quiz questions to chill out too! Before that, I just wanted to post the top 5 scores from this weekend's Quizzing Quest Grand Prix. 147 competitors took part in various locations around the country (quite an apt number considering it's the Final of the World Championship too!) Well done to Didier Bruyere and the rest of the top 5! 1. (Pictured) In 1998 he was shot in a robbery attempt and has used a wheelchair ever since. In 2012 he was nominated for the Nobel Peace Prize,for his advocacy for people with disabilities. What is the name of this man, the President of Ecuador and the only current world Head of State to permanently use a wheelchair? 2. Mainly used as a spread or dip, what name is given to the condiment, generally associated with the eastern Mediterranean region, made from sesame seeds that are soaked in water, and then crushed to separate the bran from the kernels? 3. Both adapted into successful films, which American author wrote 'Strangers On A Train' in 1950 and 'The Talented Mr Ripley in 1955? 4. Also a slang word referring to something that is fake or damaged beyond repair, what six letter word is also the title of a 1984 album by rock band Marillion, (reaching number 5 in the UK charts), and an American post punk band, lead by Ian MacKaye, releasing critically acclaimed albums such as 'Steady Diet of Nothing' (1991) and 'Red Medicine' (1995) ? 5. 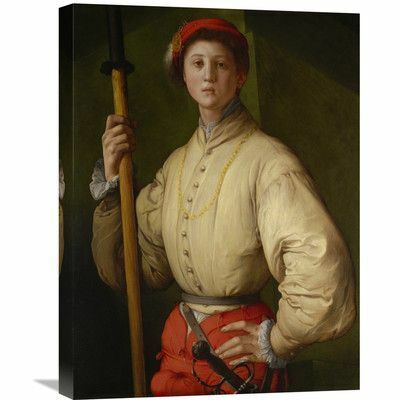 (Pictured) Portrait of a Halberdier is a 16th century painting, that was for a time, the World's most expensive painting by an 'Old Master'. It was created by Jacopo Carucci, an Italian Mannerist from the Florentine School. Beginning with the letter 'P', by what name is this artist usually known? 6. Which Asian country is home to Lake Issyk Kul, the world's second largest saline lake and also has borders with Jengish Chokusu, the highest peak in the Tian Shan mountains? 7. Used in tea,syrup and essential oil, which species of flower from the olive family, is also the national flower of Pakistan and Indonesia? 8. First airing on Netflix in 2012, it starred Steven Van Zandt as a former New York-based gangster named Frank 'The Fixer' Tagliano trying to start a new life in an isolated town in Norway. What is the name of this Norwegian-American television series promoted as 'the first time Netflix offered exclusive content'? 9.Used largely in Germany,it was designed to prevent opera singers from being asked to sing roles which he or she is incapable of performing.What is the name of this system, that classifies according to the range, weight, and colour of the voice? 10. They are the central figures of an important ancient text included within a document called Popol Vuh. In which civiliastion are the twins, Hunahpu and Xbalanque regarded as 'twin heroes', similar to that of Romulus and Remus or Castor and Pollux? 11.The Rome Golden Gala is an annual athletics meeting and part of the prestigious IAAF Diamond League series of races. In 2013 it added which Italian sprint legend's name (pictured) to the title of the meeting, after the athlete's death earlier in the year? 12. Discovered shortly after Easter 2005,it takes its name from the creator of humanity in Rapa Nui (Easter Island) mythology. What is the name of this dwarf planet located in the Kuiper Belt? 13. Adapted into the 1954 Fritz Lang film 'The Human Desire',which 19th century French author wrote the classic novel,'La Bete Humaine'? 14.Usually performed by adding an extra device,what would the musical term 'con sordina' denote? 15. Prolific American actor Steve Buscemi has appeared in over 100 films since 1985. Which is the only one of these films in which he plays a fictional character called 'Buscemi' (pictured) - it was released in 1995 and part of a trilogy?